Lounging by the pool under the sweet heat from the sun and the soft touch of the breeze is indeed everyone’s dream vacation and way of relaxation. 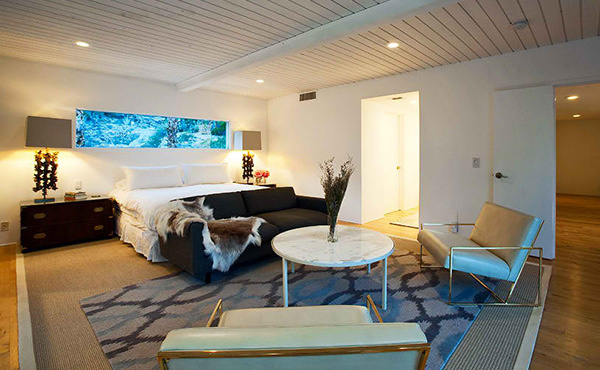 The El Portal is a homey retreat located in Palm Springs, California. It has a white volumetric shape reflecting a modern design but the comfort it can offer is that of a vacation home where family bonding isn’t all that matters but that level of relaxation and fun. El Portal sits on the base of San Jacinto Mountains in the city’s Mesa neighborhood. In that location, it overlooks o the mountains and would allow glimpses of Coachella Valley. The beauty of nature is very much seen from around the house but the house itself is already a gem. It has a clean design with Bohemian chic spaces in the interior. Outdoors, you will be greeted with a modern pool that is accented with yellow parasols and outdoor furniture which seems to extend the brightness of the sun towards the pool area. The lower level of the house comprises of social areas while the second floor contains private bedroom suites with lovely interior designs. Once you are in this vacation house, you will feel nothing but pure relaxation and for sure, you will flood your Instagram with selfies because of the stunning backdrop the house can provide anywhere you go! 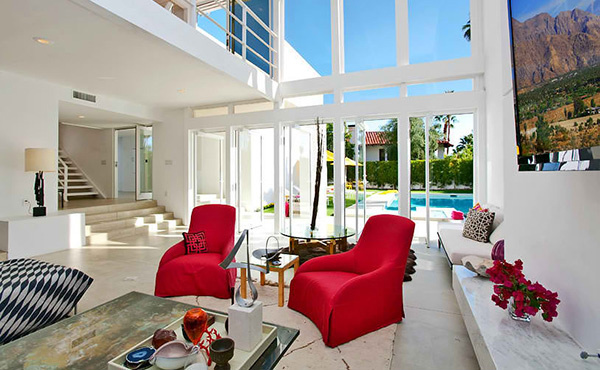 A house combining the beauty of modern design and the grandeur of a vacation home! A simple rectangular pool is adorned with bright yellow parasols, tables and loungers plus the greens that surround it. The colors here are fun and lively! At night, the house remains a gem especially with the lovely lights in it. A double-height living room with glass walls illuminates the entire home. Take a look at how the colors pop in the space because of the white walls. Bohemian chic interior is not bad at all! This space will not shy you away to cuddle on the sofa with the warmth from the fireplace. In the foyer, you can see multiple large glass pivot doors that lead to the pool. 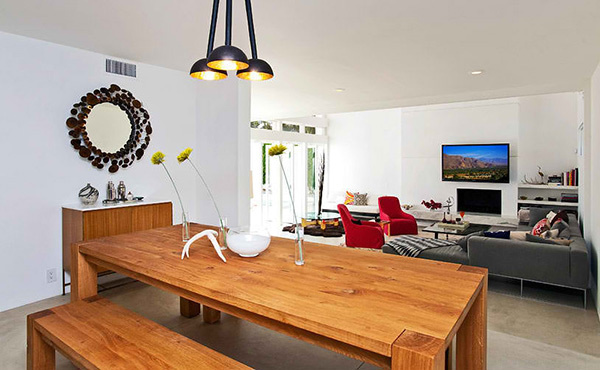 A wooden dining set is a perfect fit for this kind of interior. We love the simple yet pretty centerpiece! 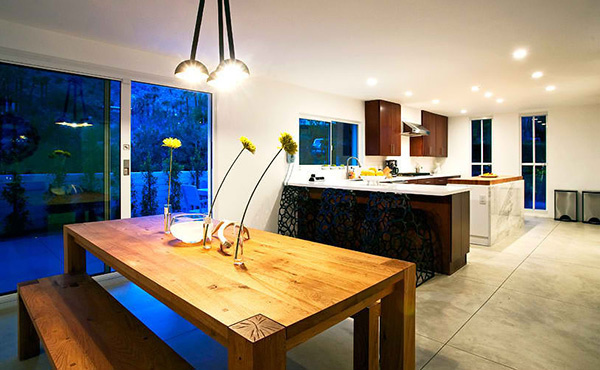 Aside from the dining area, you can also see the kitchen with unique counter height stools. One bedroom with a serene aura in grays. It has a lounge area that will be a perfect spot for conversing before retiring to bed. 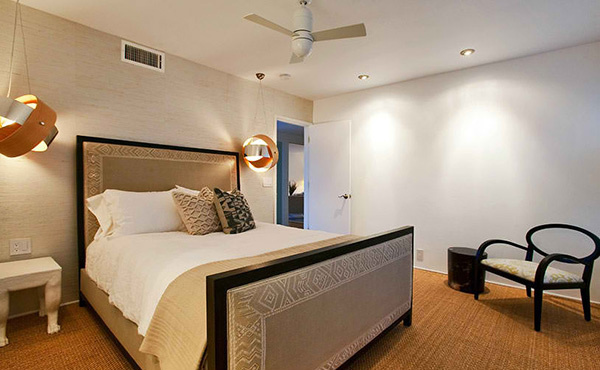 This bedroom is beautiful in warm tones accented with two pendant lights on the sides. This has a Bohemian chic look in its use combination of different furniture pieces and the colorful floral prints on the bed and bench. Of all the bedrooms, this is the most funky and lively because of the colorful wall prints. The blue and black combo is also beautiful! 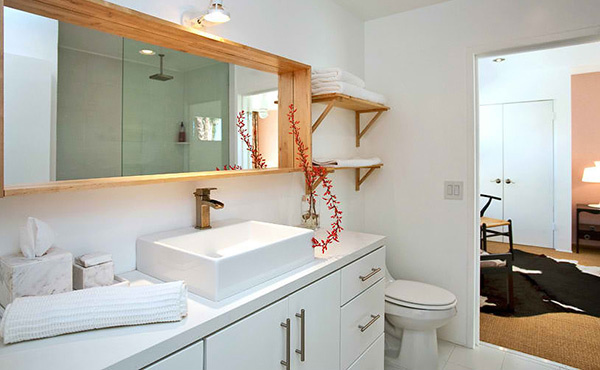 One bathroom that uses white and wood combined. 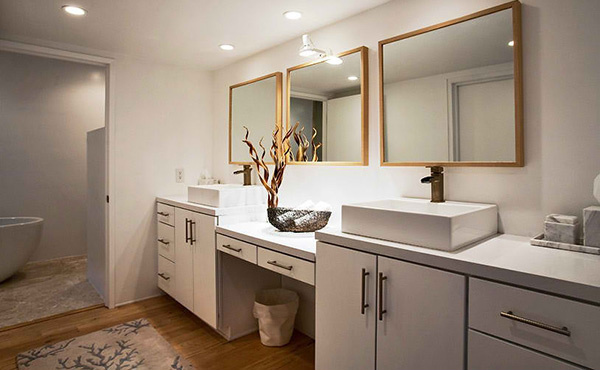 This powder room that leads to the bathroom also uses the same materials as the above space. Note that both were accessorized with natural decors. This modern fire pit complements with the lighting from the house and yes, it is superbly gorgeous! Rear of the house for the garage but we can still see here the extended beauty from the front area. Well, what can you say? We were never wrong when we said that this is one house where one can get tons of relaxation because of its lovely ambiance. In the interior, there is a double-height great room that opens to an in-ground salt-water pool and spa. A gas fireplace in white marble hearth provides warmth to the area which also has clerestory windows to lighten up the space. When cooking time comes, you can choose between the stainless steel appliance in the indoor kitchen or the outdoor gas BBQ. You can even dine in or dine out too! For sure, El Portal is the perfect place to de-stress. Would you love to get a home like this?